Ensure the security of your scope at the most important moments with scope mounts and bases from GrabAGun. Our vast selection of scope mounts, mount kits, rings, bases, and rails will help ensure your scope fits perfectly on your gun to prevent problematic miscalculations or shifts in the rail or base. 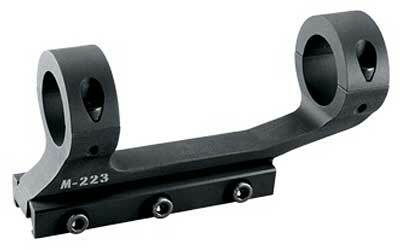 Choose from top names like Weaver and Leupold to find scopes and bases that stay in place at the most crucial times. Connect your optics systems and other accessories to your rifles, pistols, and shotguns. Some systems are sturdy and adjustable for windage, while others are lightweight for transporting your equipment. Choose from various materials and finishes to suit your needs, like rust-resistant high quality steel hard coated with a matte finish or lightweight aluminum coated in glossy black. Many bases are designed to absorb recoil. Some of our bases and rails are sold as sets, eliminating the need to search for precisely matching pieces, and many accept a variety of top mount locking rings. GrabAGun also offers drill and tap sets to help you ensure the most precise fit for the pieces of your gun. Use scope bases and rails from brands like Leupold that have been trusted for years by the U.S. Navy, the Secret Service, the U.S. Army, the U.S. Marine Corps, and the Navy SEALS.